Walking this morning with my camera in hand, I passed by some bright trumpet vine flowers and stopped to take a couple of photos. While snapping one shot, a hummingbird flew in to take a sip from the flowers. Love when that happens! It made a perfect reference photo. The picture of the hummingbird was not totally clear, but just enough for inspiration for this painting. The original of this painting is sold. Check my Etsy shop for currently available bird paintings or let me know if you'd like a print. Thanks for stopping by to enjoy the little hummingbird! 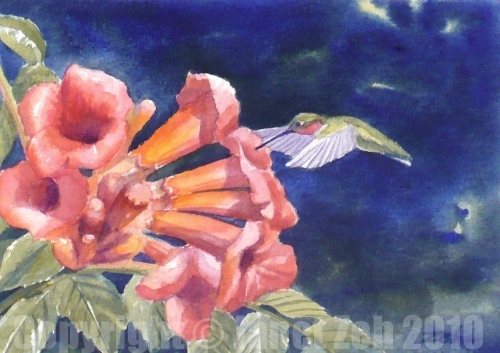 Oh, don't you just love trumpet vines and the hummingbirds they attract? Thanks! Yes trumpet vines are delightful especially for hummingbirds. Just had to paint this one.